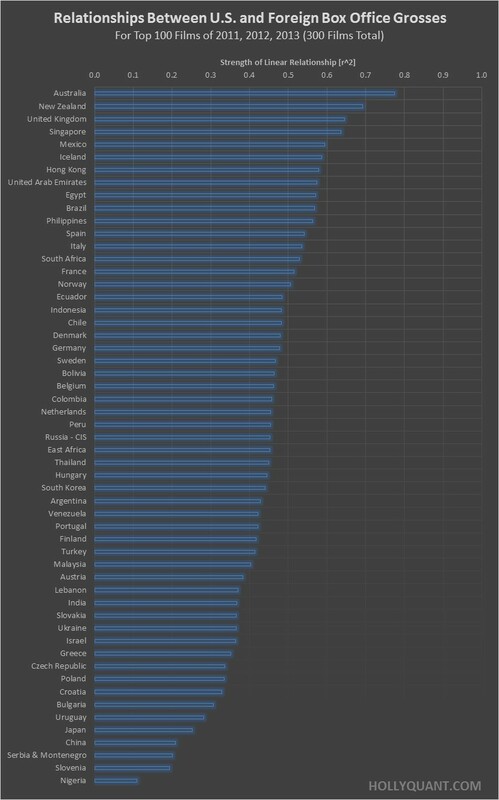 In the last post we took a look at the correlation between box office performance in the US and in all foreign territories combined. This time we take a look at the relationship between US box office and each territory separately. In other words: which countries have the most similar box office patterns to those of the US? A strong linear relationship, represented by a high r^2 value means that better box office performance in the US is strongly linked to better performance in a specific territory. Correlation is not causality, so we can NOT officially conclude that Australians, for example, just mimic Americans, but we can say that if a movie is released first in the US and does well, it is more likely to do well in Australia than it is in Slovenia, for example. “Well, duh”, you may say – it’s no surprise that English speaking countries top the list. But where it gets interesting is when we notice that the United Arab Emirates and Egypt are way up there as well. Or that Eastern European countries are not necessarily infatuated with American hype. Or that the South American countries are widely spread across the list and are not as homogenous as stereotypically assumed. Or that China is way down at the bottom, contrary to some people’s impression that the Chinese have nothing to do but wait for Will Smith. This list does not refer to the relative size of each market, but rather to the “ease of approach” to that market, so you may still prefer to target the Chinese market due to its sheer size, but I think it’s important to factor this gauge of local openness towards american cinematic product into the equation. Perhaps it will make some marketing team target Brazil before it targets Russia. Or maybe even Egypt before Japan (Hmm… Probably not, but still an interesting thought). The list is of course affected by many variables: links in marketing budgets; varying cultural taste; economies of scale and scope in distribution; local industry competition; international politics and finance; pro- and anti-american sentiments; and many other potential reasons. Please contact me with any ideas about this! A python script was used to collect domestic and foreign box office data for every country available on boxofficemojo.com – for the top 100 domestic films in 2011, 2012 and 2013 (300 films total). This plot shows the r-squared values, representing the strength of the linear relationship between box office grosses in each territory and box office grosses in the US, based on the 300 titles.